Drama Club Performs Shrek the Musical Jr.
Home | Our School | Stories | Shrek the Musical Jr.
Queen of Angels Drama Club Performs Shrek the Musical Jr. 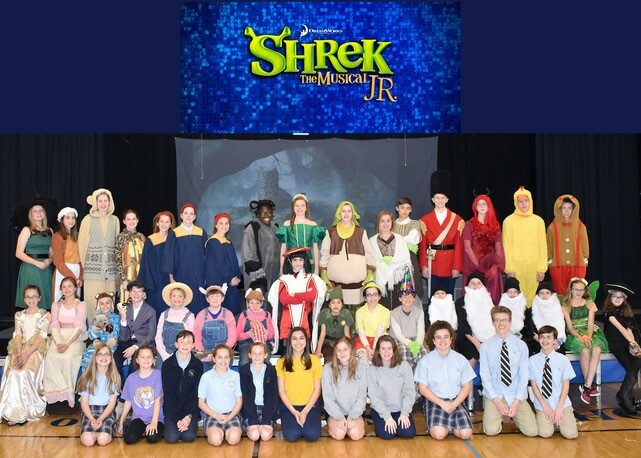 The school gym was buzzing with excitement on Friday, March 22, 2019, as parents, grandparents, siblings, alumni and students arrived to watch the Drama Club performance of Shrek the Musical Jr. Originally organized by Technology teacher, Erin Molter, the club has been entertaining audiences for the past 11 years. Each year more students participate in this fun, after school activity. Participation in Drama Club is open to any Queen of Angels student in grades 5-8. The play is selected in the spring, and auditions are held before the end of the school year. When cast selections are made early it allows students the ability to learn the music, songs and speaking parts over the summer. New to the performance this year was the use of digital scenery. This technology was a great addition to the production. The scenery changed throughout the performance, giving it a more professional quality. This scenery was made possible with funds from the Brennan Passons Memorial Fund for the Arts. Brennan Passons was a 6th grade student when she tragically passed away in October 2011. Her parents created this fund because of her love for the Arts. Admission to all of the Drama Club performances is free. Donations to are requested to continue the growth of the Brennan Passons Memorial Fund for the Arts. Laughter could be heard throughout the performance as the actors flawlessly delivered their lines with clarity and incredible timing. The students in the stage crew worked effortlessly to keep the show on pace, they then joined the cast for the final highlight of the night when they all lead the audience in a lively rendition of Neil Diamond’s song, “I’m A Believer”, one of the signature songs from the original DreamWorks movie. Many of the main characters were performed by 8th grade students who will leave Queen of Angels at the end of the year. They provided a touching tribute to the directors who they have worked with on productions since the 5th grade. Many of these students plan to continue participating in Arts programs during High School because of the foundation and experience they received during their time at Queen of Angels.